This week the Lancaster-Lebanon League softball coaches announced the 2016 All-League team. 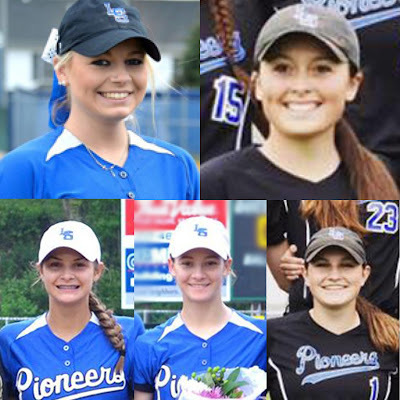 The Lampeter-Strasburg softball team has five players representing the Pioneers on the 18 member team which includes pitcher Jordan Weaver, first baseman Delaney Baker, second baseman Bri Garber, third baseman Hanna Garber, and outfielder Jordyn Kondras. Top to bottom: Jordan Weaver, Delaney Baker, Bri Garber, Hanna Garber, and Jordyn Kondras. Images courtesy of the L-S Softball Facebook. The All-League team has players from Sections 1, 2, 3, and 4.